The best are ripe Haas avocados. Check for ripeness by gently pressing the outside of the avocado. If there is no give, the avocado is not ripe yet and will not taste good. If there is a little give, the avocado is ripe. If there is a lot of give, the avocado may be past ripe and not good. In this case, taste test first before using. California produces the superior Haas avocados. Avoid the larger Florida variety. 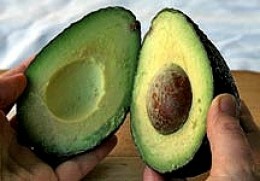 For everthing about avocados, see California Avocado Recipes www.avocado.org hosted by the California Avocado Growers. You can search site for Guacamole recipes. For my own guacamole I use Haas avocados with lime juice, finely chopped white or red onion and jalapeño, serrano or chipotle chilies, plus fresh cilantro and coarsely chopped tomatoes. I also like to add a bit of cumin and/or chile powder.. There are many ways to cut and peel an avocado, the method described below is simple and foolproof and avoids squishy bits and mess. It is simple, easy and fast. 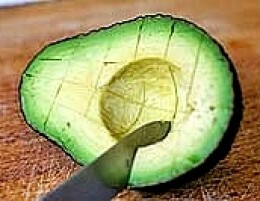 It is the perfect way to prepare avocado for the recipes included at the end of the article. Always start with avocados that are just a little firm. 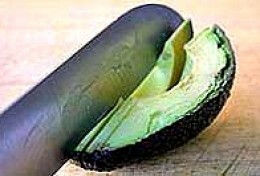 Over ripe avocados are very hard to peel, cut and prepare. To help pick a ripe one pick up an avocado that looks ripe up and look closely at the stem end. If you can pull the stem out very easily the avocado is rip. Otherwise gently squeeze an avocado - unripe one will feel hard to a gentle squeeze, the skin of an over-ripe avocado will feel a little loose. 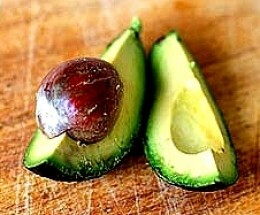 The ripeness you choose when you buy them depends and how quickly you want to use the avocados. Choose softer ones for immediate use, firmer ones for delayed use. 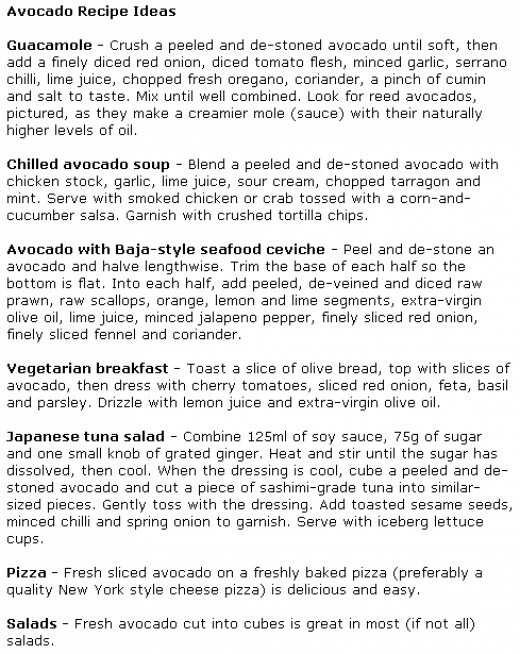 Recipes with avocado include Curried Avocado and White Bean Dip and Guacamole. Step 1. Grab the avocado gently with one hand and with a broad-blade sharp knife cut through the avocado to the seed all the way round. Step 2. Rotate one half gently while holding the other tightly. Open the two halves to expose the seed. Sector Method - One way is to make one or more cuts, lengthwise on the half avocado that has the seed so that it is easier to remove each of the sectors with skin attached. You can gently twist the knife blade between the sectors to separate the sectors from the seed. Spoon Method - You can simply use a spoon to scoop out the seed. Insert a Knife into the Seed - This method can be dangerous so be careful. Using a towel and grab the avocado with the seed pointing upward. Gently swing the knife so that the blade wedges firmly. The knife can then be used to pull the seed out after rotating it slightly. Step 4. 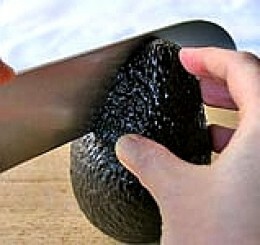 Removing the flesh - the method you use depends on whether you want to keep the avocado in halves or sectors or chop the avocado. 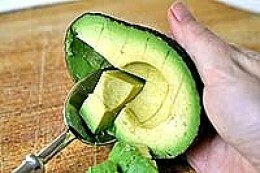 Spoon Method - you can simply scoop out the flesh of the avocado with a spoon, which is ideal for preparing guacamole. To make it easier to scoop out the flesh, take a small knife and gently make a series of cuts in a cross-hatch pattern. Only cut into the flesh not into the avocado peel. 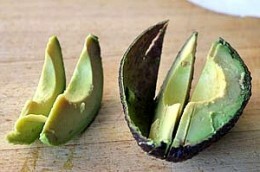 Then you can easily use a spoon to scoop out the avocado pieces. 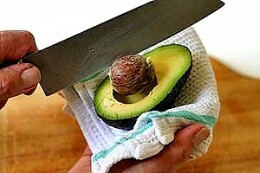 Sector method - use a knife to slice the flesh of the avocado halves into sections. It does not matter if you cut through the peel. 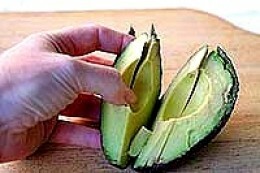 Use your fingers to gently remove the avocado sectors from the peel. Squeeze some fresh lime or lemon juice on the exposed area and seal it with plastic film as airtight as you can. Store in the fridge with the cut side down. Spray the cut surface with a little cooking oil spray sprayed and covered it with foil and store in the fridge. 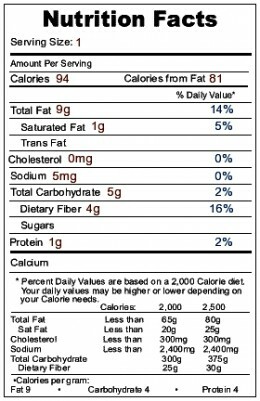 Avocado is much more than just a tasty addition to dips such as guacamole. It can be the base of a hearty satisfying meal when eaten in salads, added to pizza and tacos and in many other dishes. Avocados contain many vitamins, minerals, active enzymes,soluble fiber, easily digested proteins and fats. Avocados make a delightful addition and accompaniment to many meat and poultry dishes, and are ideal for snacks.